OIL ON PAPER, 24" BY 18"
One concept that recurs frequently in my collection is the notion of things appearing to be something that they are not. For example, I have a wooden sculpture that appears, at first glance, to be made of glass; I have a painting that looks so much like a photograph that it fools almost everyone who looks at it; and I have several objects made of glass that normally would not be (a hammer, bags, a screw, Q-Tips). So, when I saw this painting depicting an object in glass, I was immediately drawn to it. A fishbowl is a difficult object to paint, for a couple of reasons. First, it's basically transparent; how do you paint something that has no color of its own, but which refracts light and still casts a shadow? And second, as a spherical, reflective object, it's going to reflect virtually everything in the room, especially windows and other light sources. If you don't properly address these issues, the result simply won't look realistic. Despite these challenges, Kit has captured the essence of a fishbowl extremely well. The detail she has applied is so comprehensive that it took me a few viewings of this work to notice it all... the reflections of windows, the bright pinpoint reflections of overhead light sources, the shape and coloring of the shadow cast by the fishbowl. 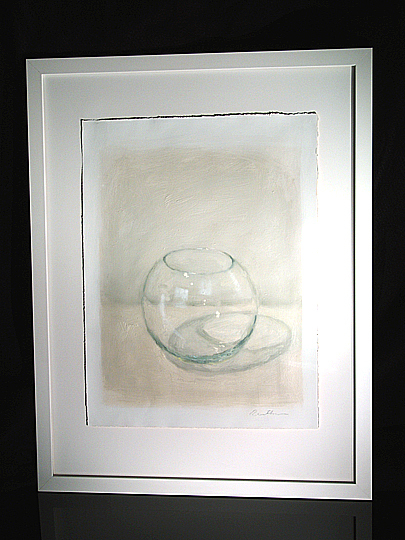 In addition, Kit's use of color (or lack thereof... this is one of the most colorless works in my collection) is suitably subtle, just enough to properly capture the bowl, the surface upon which it rests, and the wall beyond. I also really like how this work is framed... just a plain white frame, with plenty of space between the work and the frame. Anything else might have risked nullifying the effect that the painting's lack of color creates. Ironically, an empty fishbowl contains plenty of potential symbolism... but I just like the bowl as an object. Glass, captured on paper.